Impressive picture performance characterized by good clarity and vibrant, rich color - is how I would introduce this Sharp LCD offering. This Sharp LCD runs warm as one of its only picture negatives. The major setting that needs toggling to correct the reddish appearance of flesh tones is the Color adjustment, which should be set at around -10 to give the viewer a more realistic picture especially in flesh tones. All other picture settings are better left alone as they render little change in result. The only preset picture options are controlled by the bright button on the remote. These "advanced" settings of normal, bright, and dark increase or decrease contrast and thus the appearance of brightness. With a TV of this size you will most likely view the unit on bright most of the time. 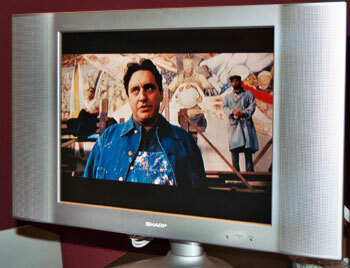 The second drawback of the unit is a motion trailer effect, which is prevalent in most LCD TVs. This is caused by a signal response time which Sharp claims is 15 milliseconds compared with a plasma display which has a signal response time of 7 milliseconds. On almost all LCD TVs fast motion scenes can display some trailer effect and that is true of this unit as well. Viewing angle is a strong point of Sharp LCD TVs compared to other manufactures as the company is constantly striving to improve its LCD panel performance. Sharp is the dominant player in LCD manufacturing and many companies OEM the panel for their LCD display offerings from Sharp. For this reason Sharp is the leader, along with possibly Samsung in quality development in the LCD world. The three areas of major concern are contrast - which on this 20" unit appears solid, viewing angle - which I measure at about 60 degrees before loss of picture quality, and signal response time - which is improving but still lagging such technologies as plasma. Sound is spotty from the 2.5 watts per channel speakers - the worst tested - though probably sufficient for most applications. The speakers are on each side and are rather large for a 20" monitor - especially considering the very modest ouput. Operations and remote function for the unit are quite simple. Inputs have everything but a VGA style 15 pin input for computer and the unit only has 1 set of component video inputs. There is a parental control device on board as well as a nice channel memory feature. Sharp 20" LCDs are competitive but never strive to be the cheapest - believing their product to be superior. This unit can be found in the $1200 range and is a good buy at the price in today's market.